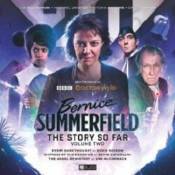 Starring Lisa Bowerman as Bernice Summerfield. Every Dark Thought: The Doctor (Michael Jayston) has asked for Benny's help digging up some mysterious ruins. He claims they contain the secret of eternal life. Why would the Doctor want that? Empress of the Drahvins: Benny and her friend Ruth honestly don't mean to cause a revolution. When they crashland on the planet Drahva, they just want to get off it immediately. But the fearsome matriarchy has other ideas for Benny and Ruth. The Angel of History: Annis is an archaeology lecturer at a university. Under fire from friends, students and the police for holding entirely the wrong view of history, the only person who seems to believe her is a mysterious Professor.